The tawny owl was the 2009 Bird of the year of the Estonian Ornithological Society and a web camera was placed into the nest hollow of the tawny owls for the first time in Estonia and nearby countries. That time the female laid her first egg already on March 1st which was three weeks earlier than usual. The web camera that transmitted the view from the nest hollow became very popular, and so the camera was opened the following year too. In the cold spring of 2010 the female laid her first egg only on April 6th. The tawny owl pair was named by the Looduskalender forum: Klaara and Klaus. Last autumn a gale broke the home tree of the tawny owls. Craftsmen from the Keskkonnaamet (Estonian Environmental Board) and RMK (State Forest Management) made a nest stock for Klaus and Klaara from the same hollow tree and it was placed near the old nesting tree. On March 1st this year a small Mobotix infrared camera (Estonian representative Beta Group OÜ) was placed by Estonian Ornithological Society in the hollow, and IR illumination suitable for the hollow was supplemented by Videovalve. The tawny owls Klaara and Klaus have accepted the new nest stock and they started nesting on March 19th, before the camera stream was made public. We will see how Klaara and Klaus’s nest life will develop this year. 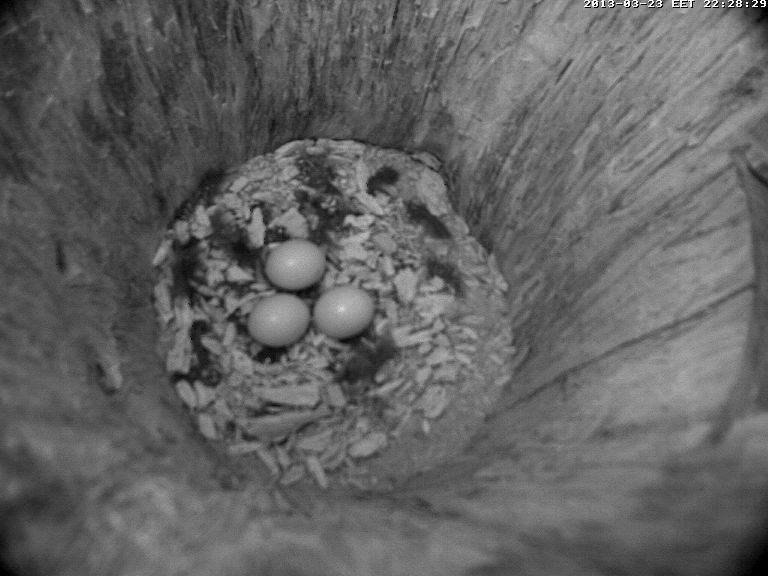 In the evening of March 24th there were three eggs in the nest. The ITrotid helped to supplement the transmission system. From Läänemaa the camera stream reaches the EENeti server in Tartu by way of the Tele2/Televõrk connection. More information on what goes on is in the Looduskalender forum and on the home page of the Estonian Ornithological Society. The Estonian Ornithological Society´s tawny owl web camera project is supported by the Keskkonnainvesteeringute Keskus.